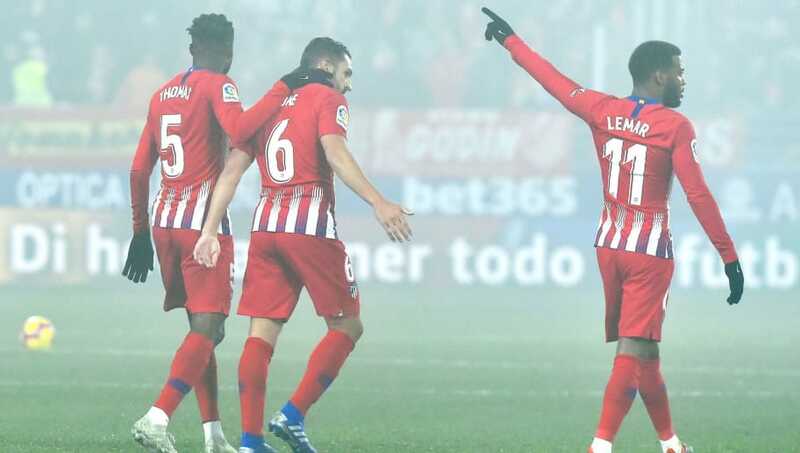 Atletico Madrid closed the gap between themselves and La Liga leaders Barcelona to just two points after an emphatic win at Huesca on Saturday night. The hosts were outclassed as Lucas Hernandez tucked in at the back post in the first half before before right back Santiago Arias converted Antoine Griezmann's sublime cross seven minutes after the interval. ⏱ 90'+ | 0-3 | FULL-TIME in Huesca! Big win for our lads and ➕3⃣ points! Koke wrapped up the scoring in the second half, poking in after Griezmann hit the crossbar. Atletico have let themselves down in this year's title race with too many draws away from home. However, their killer instinct was on show for all to see as they battered a discouraged Huesca outfit. While he didn't get on the scoresheet, Griezmann was at his brilliant best, continuing his brilliant recent form which included a run of seven goals in six games. With Diego Godin and Jose Gimenez in defence, the visitors were solid and never looked in any harm against Huesca's blunt attack. Starting XI: Oblak (6); Arias (9), Gimenez (7), Godin (7), Hernandez (8); Rodri (7), Partey (7); Correa (7), Koke (8), Lemar (7); Griezmann (8). STAR MAN - Arias was an absolute rock at right back on Saturday evening, winning two tackles and three aerial duels, and deservedly got on the scoresheet in the 52nd minute. Atleti were not short of star performers, with Griezmann, Koke and Angel Correa all terrorising Huesca whenever they got on the ball. WORST PLAYER - It's hard to criticise a side after such an accomplished performance. Jan Oblak made only three saves and none of the substitutes made much of an impact, but no player was actively bad on Saturday night. Atletico are next in action against Getafe before a trip to Real Betis in early February and a Madrid derby. Their Champions League campaign resumes with a home tie ​against Juventus on February 20.